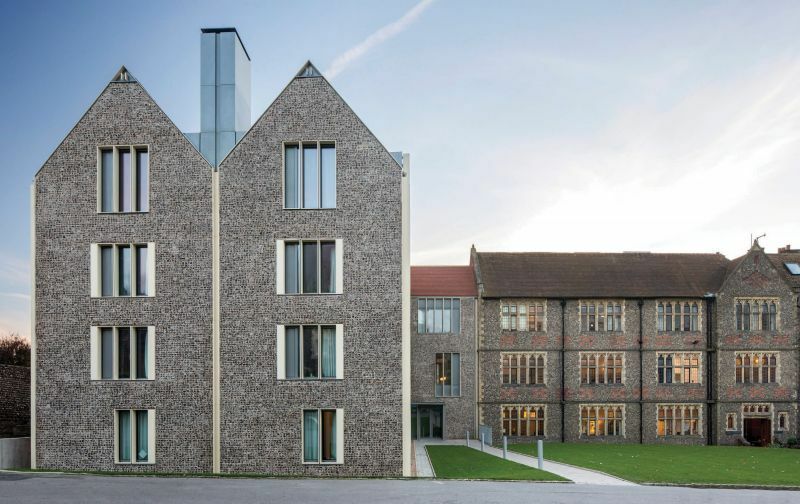 A win in the Civic Trust Awards for the Boading House, this project provides new boarding accommodation as part of a building programme to improve facilities for Brighton College pupils. The self-contained three and four-storey boarding house adjacent to the Grade II listed Dawson House forms a new eastern edge to the campus and completes the quadrangle envisaged by Thomas Graham Jackson in 1884. The building contains a mix of school facilities for the College’s own use, related to student and staff accommodation and pastoral care. Designed to be clearly contemporary in construction detail but contextual in material, massing and form, interconnected double height spaces create a surprising internal spatial arrangement in contrast to the regular rhythm of the facades expressing the bedroom modules. Inspired by its Venetian Gothic neighbours, the new facade design of the Boarding House is composed in layers. The solid inner leaf of the external walls, with its window apertures, provides the structural and environmental enclosure; this is the ‘modern functional building’. A relatively thin outer layer comprises the masonry layer cladding of either flint or brickwork. A filigree of fine metalwork linings, like the terracotta (or stone) mullions of the 19th Century windows, partially conceals the window frames and vent panels. Ze Nunes, Director of MACH Acoustics says of the architect "it's always a pleasure supporting Allies and Morrison, we find them engaging to work with and as usual they create something truly impressive."